www.dwarkaparichay.com has successfully completed it’s seven years in the service of public interest. 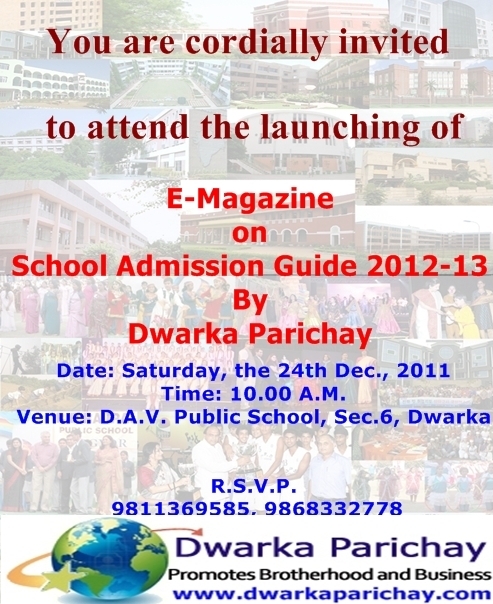 Now, with the grace of Almighty and good wishes of well wishers, we are planning to launch an E-Magazine on School Admission Guide 2012-13. on 24th December, 2011 at D.A.V. Public School, Sector-6, Dwarka. According to Mr.S.S.Dogra-Managing Editor-Dwarka Parichay, this E-Magazine includes different topics like Guidelines issued by Department of Education, Right to Education Act,2009, EWS Quota System, documents required at the admission, admission schedule, Useful articles/ tips for parents & students, Nation wide Survey Report on School admission, Parents views/comments, eligibility criteria, list of schools etc. It’s a gift for those who are eco-friendly & love to Save Paper. This E-Magazine will be available free of cost on our website. Being the media house , we get thousands of query about school admission. So, we have tried to meet out the hunt of the parents .The dedicated team work of www.dwarkaparichay.com that gathered maximum information related to school admission procedure, guidelines issued by the Education Department & CBSE, survey, important data of different schools like play, secondary & Senior secondary Schools of Delhi & NCR. Our aim, is, to provide a platform for the parents community to obtain the latest information (for the Academic session 2012-2013) create more transparency related to Admission. School Admission Guide -2012-13 now! To Stop Slap Sensation-Any Short Cut ?